It’s supposed to be cherry blossom time in our nation’s capital. This year marks the 100th anniversary of Japan’s gift to the US of 3020 cherry trees which were planted around Washington’s tidal basin. First Lady Helen Taft and Viscountess Chinda, wife of the Japanese ambassador, planted the first two trees at a modest ceremony on March 27, 1912. This year’s Cherry Blossom Festival is a five week extravaganza, from March 20 through April 27. 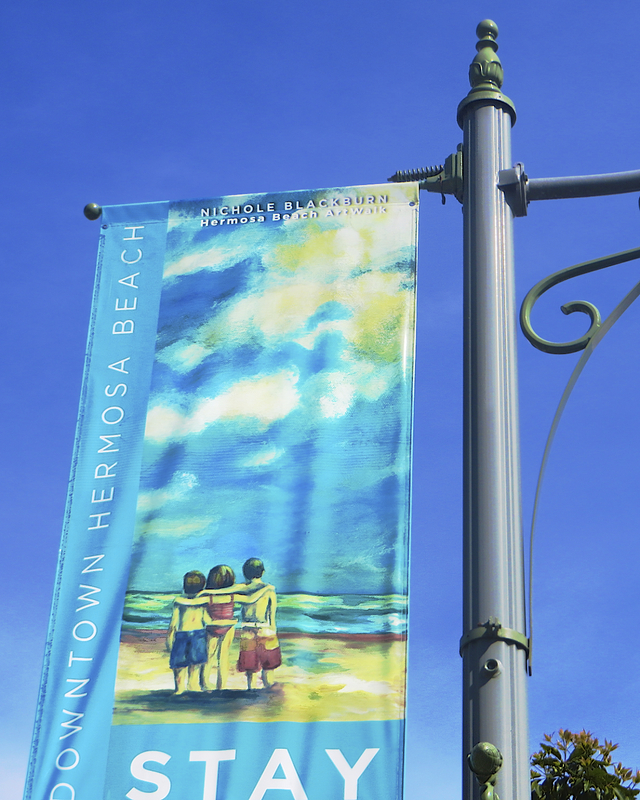 There are art exhibits, sushi tastings, performances, parades. To celebrate, the US Postal Service issued these glorious commemorative stamps by artist Paul Rogers. But there’s a small problem. 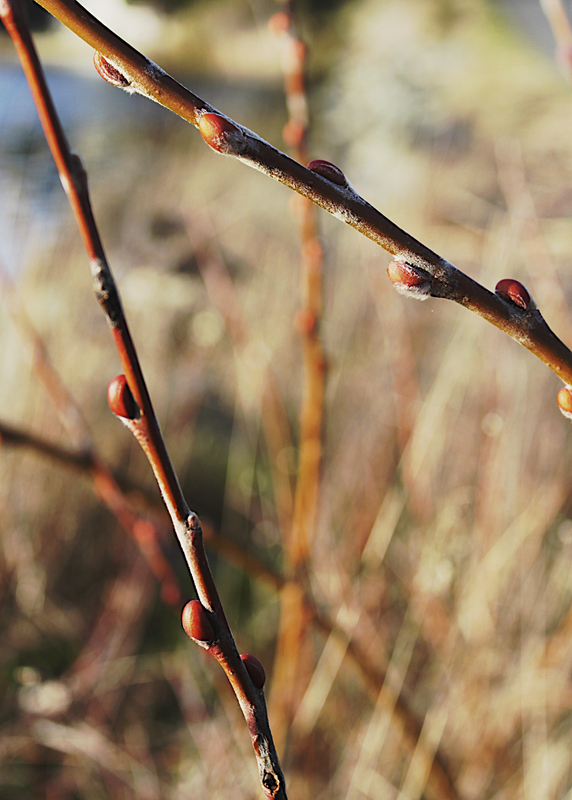 Usually the peak bloom (when 70% of blossoms are open) is in early April. But this year, it began March 20 and was over March 23. The Park Service projects the whole bloom to be over by March 26. The remaining month of the celebration will occur without the guest of honor—the cherry blossoms—which usually attract over one million visitors annually. Some other March statistics: International Falls, MN whose average March high temperature is 35°, flagged in at 79° March 18. Quick math: that’s 44° above average, and an amazing 13° above the previous high for March. On March 12 Boston reached 71°, breaking a 110 year record. 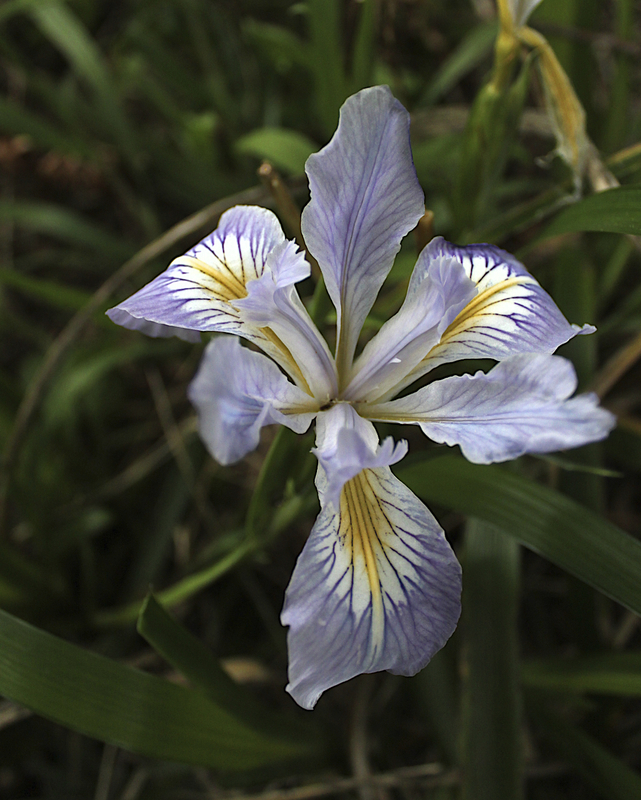 Flowers are blooming a month early across the Northeast and Midwest. 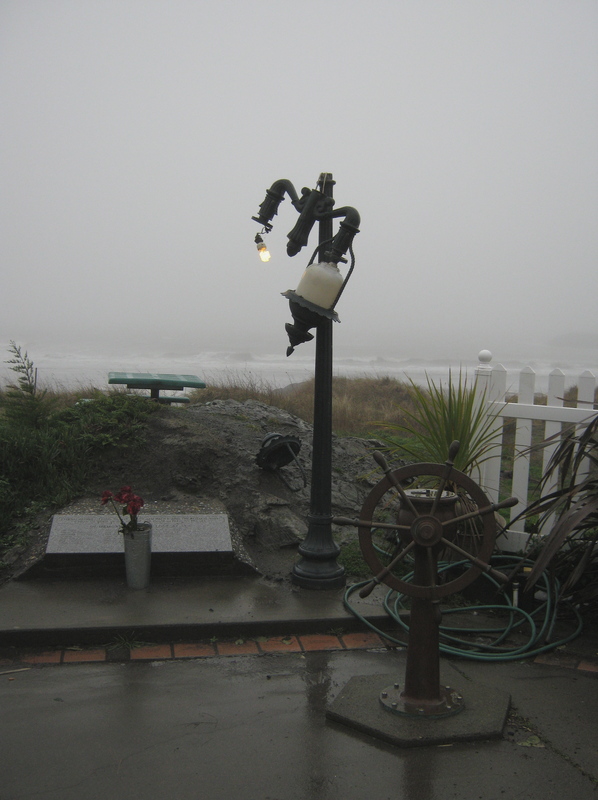 Only we here on the Oregon Coast seem to be about average, US weather-wise. On March 26, Scientific American posted an article titled, “Global Warming Close to Becoming Irreversible.” Scientists warn we’ve got to do something pretty big by 2020 or we’ll likely go beyond the tipping point. Melting glaciers, dying rain forests, acidified oceans. The whole nine yards. (www.scientificamerican.com/article.cfm?id=global-warming-close-to-becoming-ir). Even the New York Times (gasp!) has finally had to admit, in a March 26 article in the Science section, that people just might have something to do with it. Meanwhile March 29 the Senate presented another side of Japanese culture, the kabuki dance, when they (surprise!) 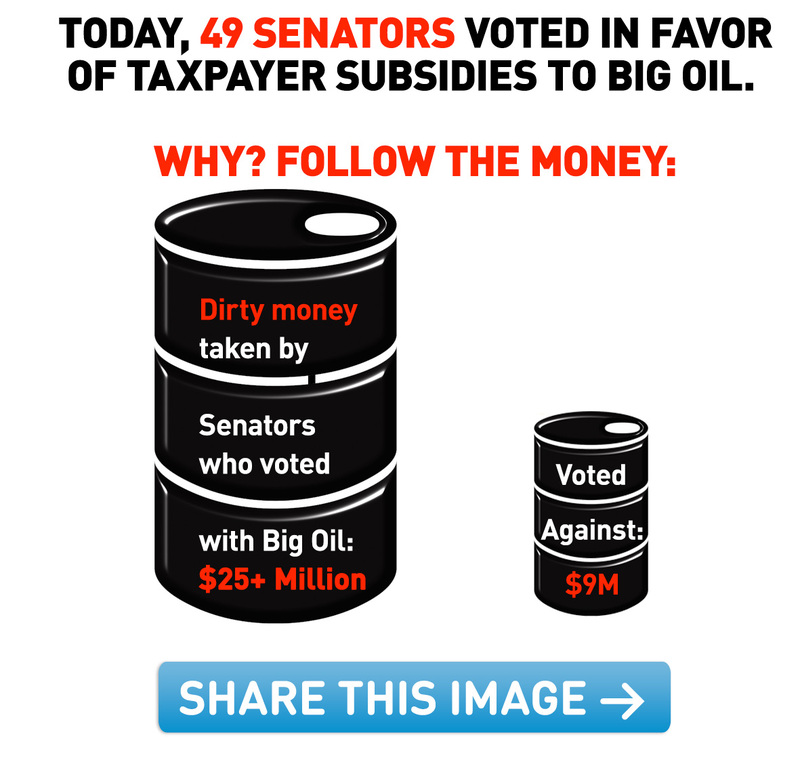 refused to stop oil subsidies to the top five big US oil companies. Nothing like good stewardship of our finances (aren’t they the ones wringing their hands about the deficit?). Much less our planetary future. You can share this image by going to: www.350.org. I know I’m over a month early but there are too many signs not to recognize that Spring is in the air. 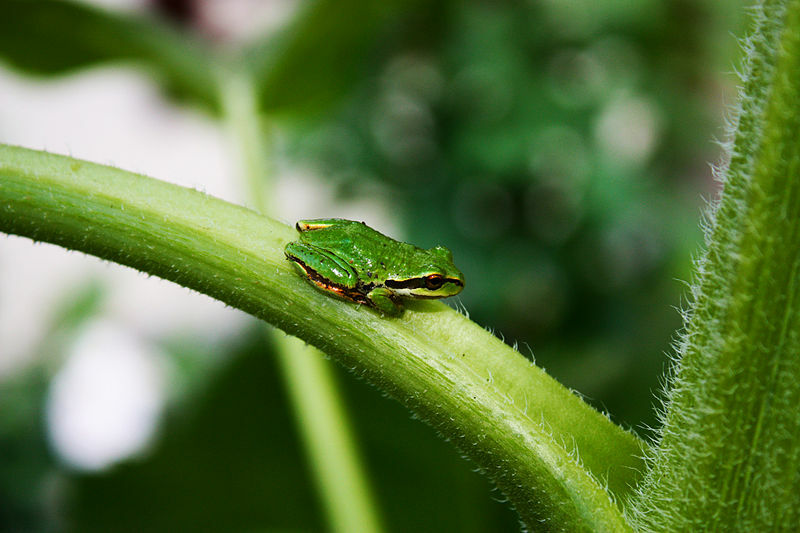 The wonderful frogs we call “peepers” (they’re really Pacific Tree Frogs) have begun to hunt for mates, chirruping from the nearby wetland. Birds have also begun their predawn serenades. The robins and redwing blackbirds are flocking. 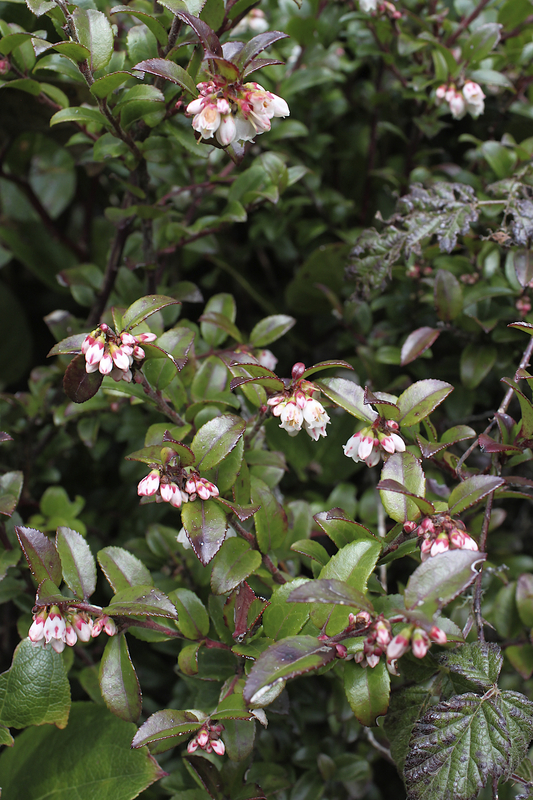 Last year we noted spring flowers in April. 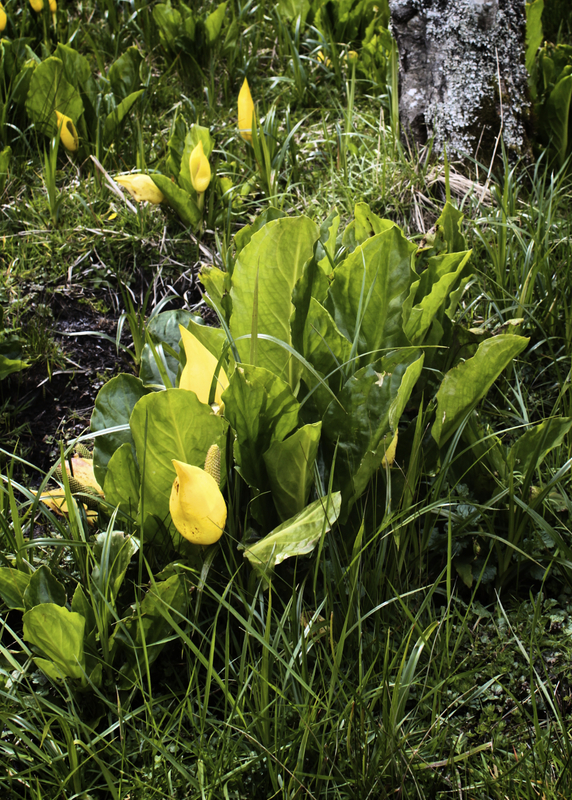 This year, we’ve already seen pussywillows bursting and the first shy woodland yellow violets. 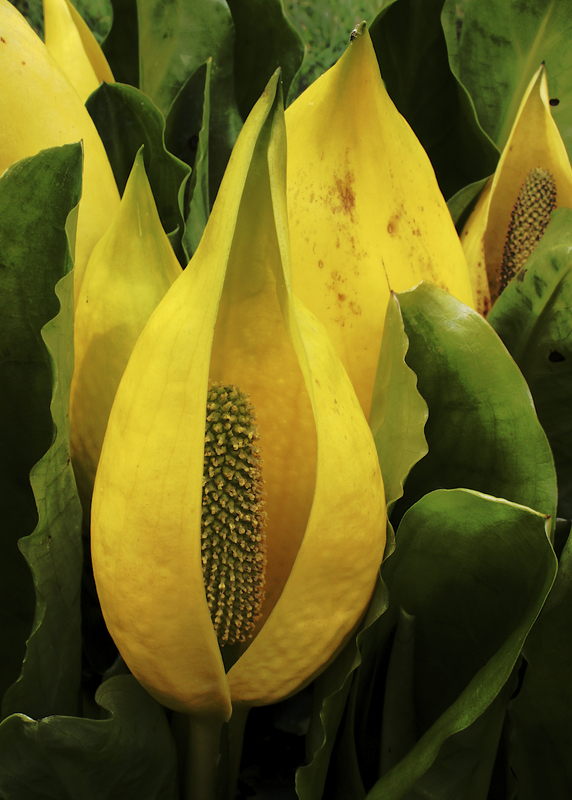 Even the skunk cabbage has begun to send out sensuous buttery blooms. Quince have begun to flower. As our local year turns its back on winter and faces towards the equinox (as does most of the US) in other parts of the world this has been a bruising season. Europe has had record smashing cold with snow in Rome, and subzero weather in the east. Istanbul has had snow, so too, the mountains in Libya and Algeria. Japan has had blizzards. Climate scientists aren’t surprised. For them, and most of us sentient beings, these wild gyrations only underscore the urgency of addressing global climate change now. Meanwhile politicians pass state laws requiring the teaching of denier “science” and presidential hopefuls madly scramble to put distance between themselves and climate reality. Of course the federal government, by refusing to address the issue at all, just adds to my pervading sense of frustration and gloom. 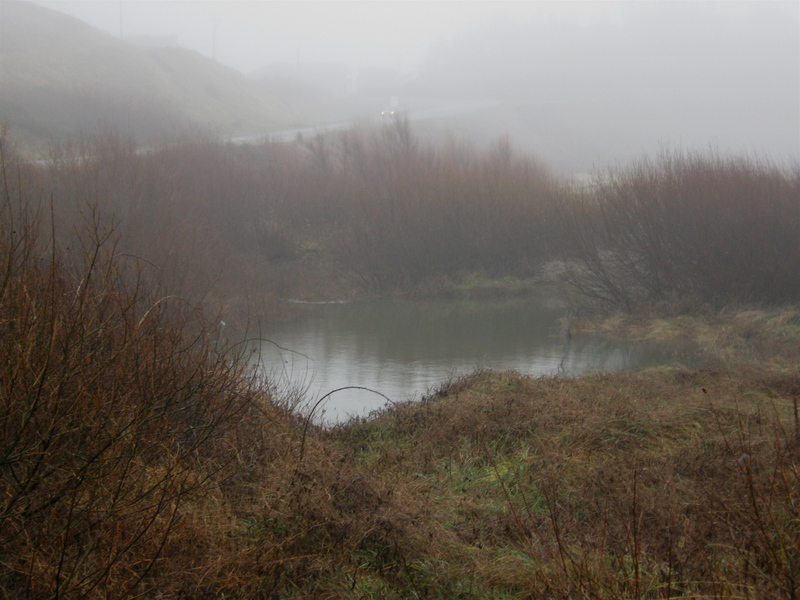 After weeks of unusual mostly dry weather, winter rain finally arrived on the Southern Oregon Coast. Storms began to roll in last week and by Tuesday, a day we had to travel north, rain began to fall in earnest. Taking a chance, we returned. And yes, there were gale force winds on US 101. At Reedsport, we saw half a trailer house in transit, blown over on its side off the road, plastic sheeting waving, tires in the air. By the Sixes River valley the rain was sheeting toward the car as we headed directly into the wind. Cresting the next hill (at the Cape Blanco turnoff) it wasn’t at all hard to imagine 100 mph gusts just six miles west. Entering Port Orford, the Hazardous Winds Next 27 Miles if Flashing sign’s lights were definitely blinking. Stan couldn’t feel his hands for clutching the steering wheel. We headed directly to the port to see if the parking lot was underwater, another of the worst-case predictions. Nope, but all was dark and quiet. 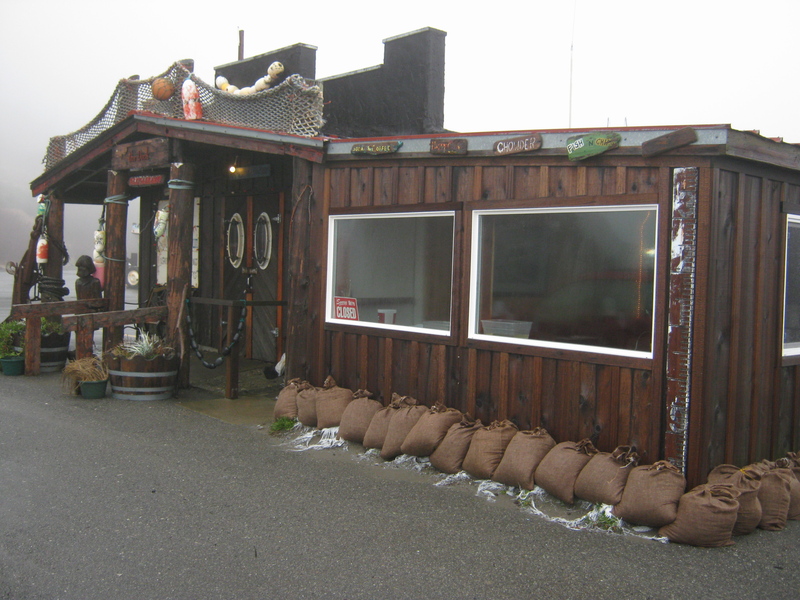 Turns out all the dock businesses had sandbagged and left, literally turning off the lights (the electricity had been disconnected) behind them. Once home, the County Sheriff’s Wednesday morning robomessage phone alert (a first) underscored the storm’s potential. All told we got close to nine inches of rain, over seven of it Wednesday. Today, we hit the beach to view another high surf event, 25-30 foot breakers. Right now it’s sunny. But we’re just between the acts. We’re supposed to get rain for the next seven days. It’s beginning to look like winter in Oregon. 2011 was a banner year for the Southern Oregon Coast natural history lovers. We had rain (naturally), snow, a tsunami, a threat to one of our most treasured natural areas (stopped by citizen action! ), a profusion of wildflowers beginning in March with trillium and skunk cabbage, followed by iris and tangles of sweet peas and ending in fall in a burst of asters, a brilliant Fourth of July, blue skies and wind throughout summer, a delightful fall and a dry start to winter. We ended the year 21 inches behind in rainfall! Take a look at our glorious coast as it looked across the seasons. Happy New Year! I’ve found people who grow vegetables plant their gardens for a variety of reasons. Some like to dig in the dirt; some like to know where their food comes from and what’s in it; some just love to see the brown earth of a spring plot yield to vegetables green and yellow and orange. Some are looking for a particular favorite, say pattypan squash or fava beans. Some are after exotic herbs. 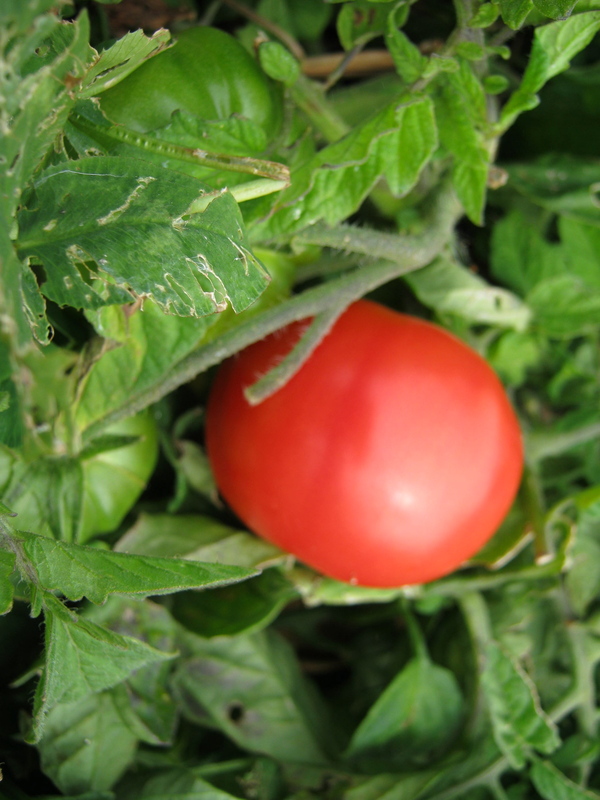 But secretly, I think everyone would agree that most of all, we’re all yearning for a real tomato. When I was a child I didn’t like tomatoes. Of course the only ones I knew came from the store in four-packs—cellophane-encased, single file in a little white plastic tray. 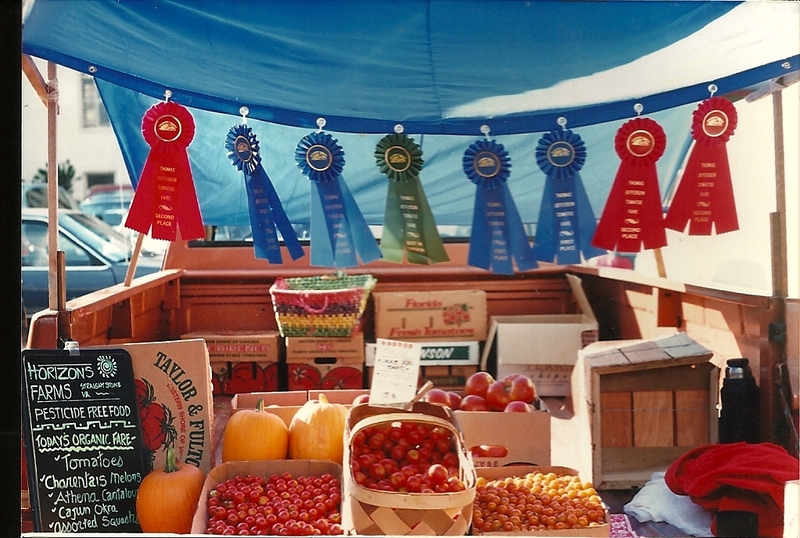 Later in north Jersey there was a farm stand nearby (honest, people still grew veges in the “Garden State” back then) and the tomatoes my mom got there were higher up on the scale. She and my sister used to eat tomato sandwiches—thick tomato slices between Miracle Whipped™, Sunbeam™ soft white bread. Still, I demurred. But on our own organic farm in Piedmont VA, I came to my senses. Of course we grew, hands down, the world’s best tasting tomatoes. And in multiple varieties: incomparable SunGold cherries; Sheriff paste tomatoes; chunky slicing Big Beef; heirloom Brandywine. Checking our farm records, I discovered we picked over 500 pounds of tomatoes in one week in July! Here on the cool Oregon coast, expectations are lower, much lower. Instead of pounds we measure in units; instead of being overwhelmed with the sheer volume we’re down in the garden each day, urging those Oregon Spring individuals which have set to ripen. A triumph, we picked our first two (almost) red ones a few days ago. One molded overnight; the other was actually pretty good. 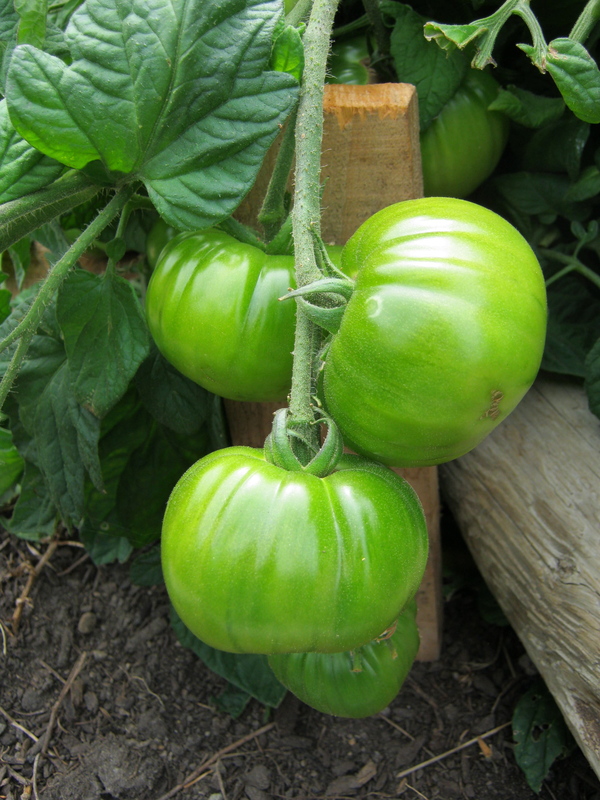 Another is now ripening on a west facing window sill. Our SunGolds have made a valiant, but futile, stand against the deer. The orange cherry tomatoes, alas, have grown only leaves. The last two days have been mid-50°s with fog (sigh). As I write the heat has come on in the living room. Still, the weather radio speaks of sun and 80° for two days next week! 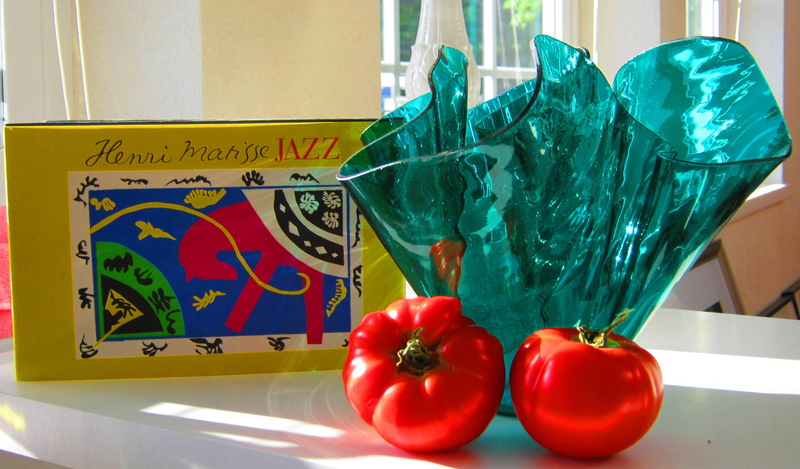 Perfect tomato ripening weather. Hope springs eternal in the hearts of all us tomato farmers here in Port Orford. May has been a banner month here in Port Orford. First: The weather (A constant topic of conversation.) The rain seems to be diminishing. That’s not to say it’s not still pouring 1/2 inch or so fairly regularly. But it’s generally been at night or has come in a huge splashy shower followed by watery blue sky and sun. Nor has it warmed up much, although a sunny 60° has come to feel positively toasty. Second: We’ve gotten more dining opportunities! El Puerto Mexican just opened and it’s delicious too. 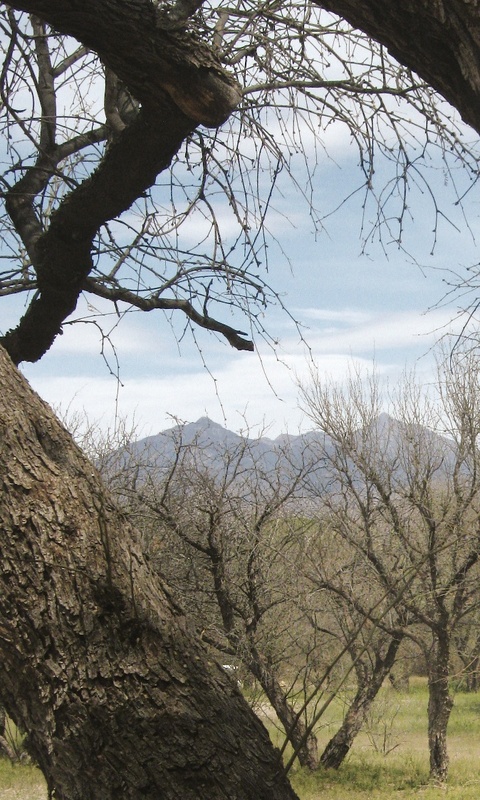 Overstuffed burritos and doubled soft tacos (the favored way in New Mexico). Even Jararito Mango Soda. And good hot red sauce. Or tomatillo-based green—flavorful but not diablo. Dessert? Homemade, unbelievably rich coconut flan. Rumors are flying we may get another new eatery in the next month or so. Third: Our very own Jeff H. finished in the top 15% of runners (all 42,000 of them!) in San Francisco’s 100th Bay to Breakers Marathon. It was his first marathon ever. Bravo! 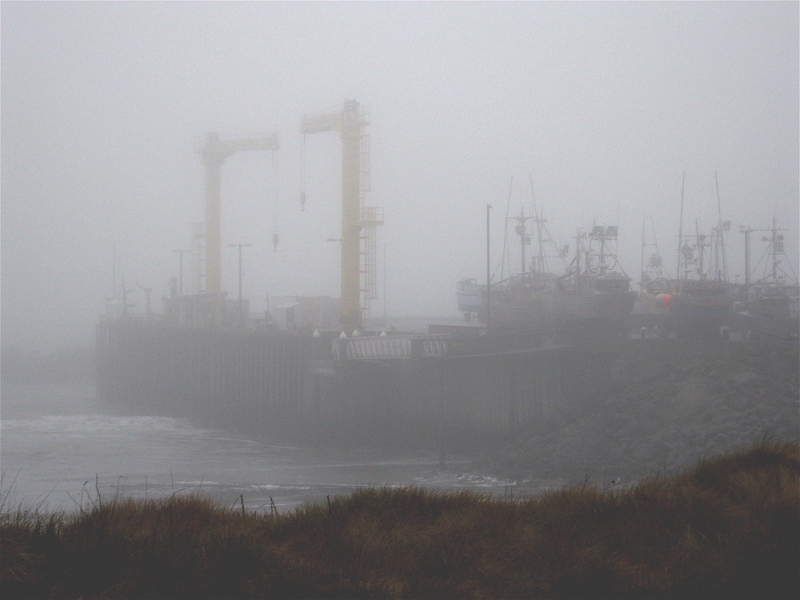 The citizens of Port Orford have been getting a little, well, crabby of late. Understandably it seems. March rain records are in and they show that every single day save one in March we had measurable rain. Thankfully, in the last week we’ve had some sunshine, granted watery at times, but there were shadows; at times even sunglasses were in order. It’s amazing how much warmer 54° is in sun than in wind and rain. And all that rain has brought the woods alive with birdsongs and spring flowers. 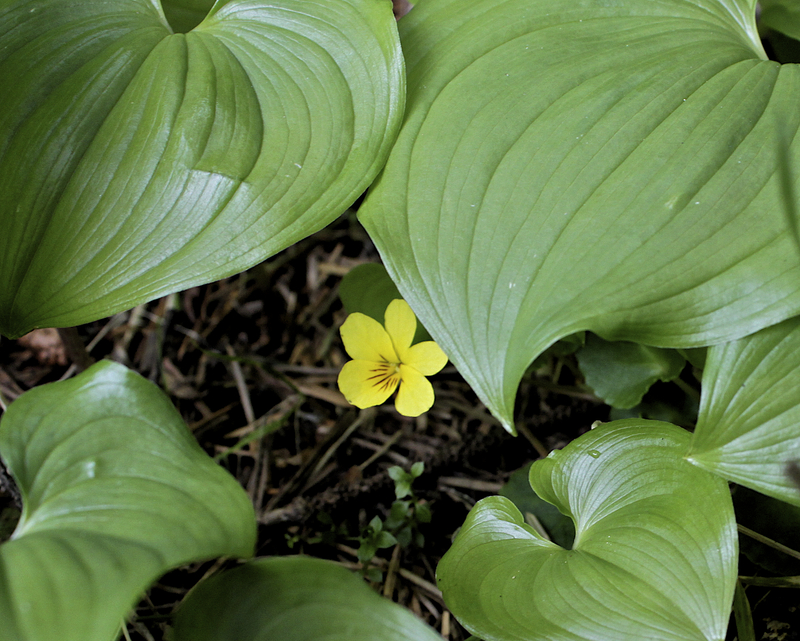 Granted we’ve been seeing the little yellow Dark Woods violet (Viola orbiculata) since late February. 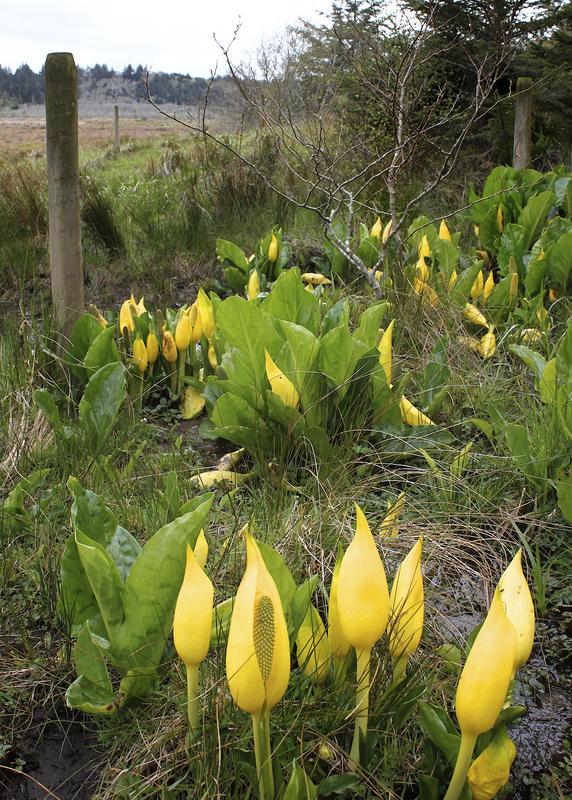 But about two weeks ago (just about the time the robins started singing), the wetlands filled with giant leafed Skunk Cabbage (Lysichiton americanus), its yellow cupped flower filling the air with its signature aroma. 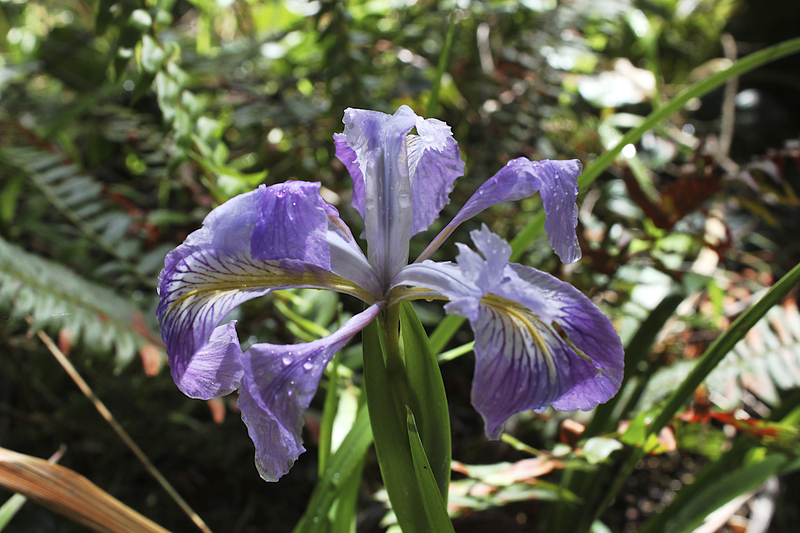 Now the Blue Flags(Iris tenax) are out on the steep south slopes of Nellie’s Cove trail at Port Orford Heads State Park. And about a week ago, perhaps the most exciting of all, the Western Trillium (Trillium ovatum) appeared on the same trail, in the dark deep Doug fir duff. Also called the Trinity flower, trillium is a three-petaled flower with three leaves. Mostly they are white, turning pink to rose as they age. 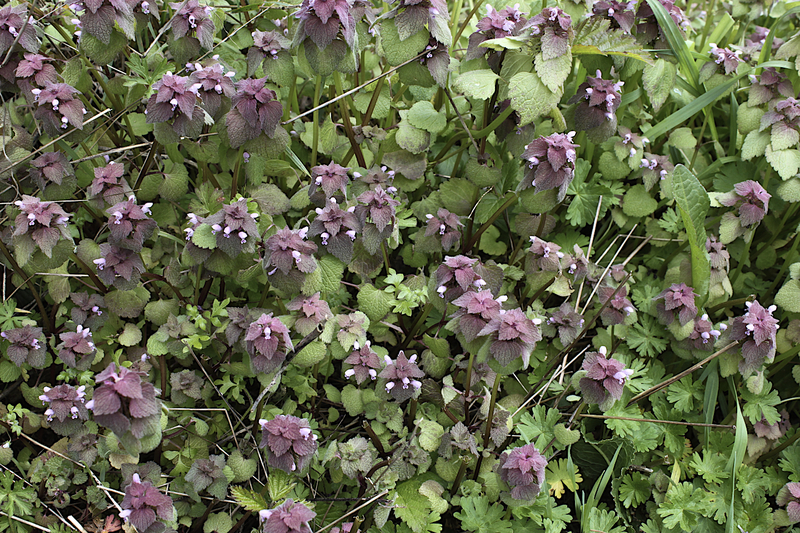 We were lucky enough to see an unusual almost mauve young flower. 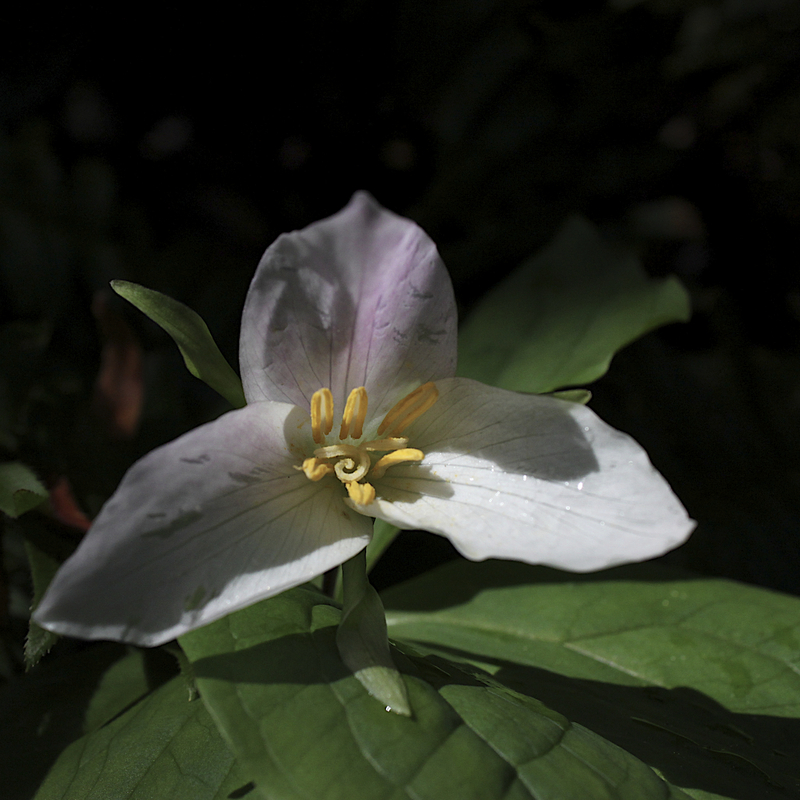 Though not terribly rare, because of their life cycle trillium have a rough time of it. Trilliums reemerge each year from the same underground rhizomes. 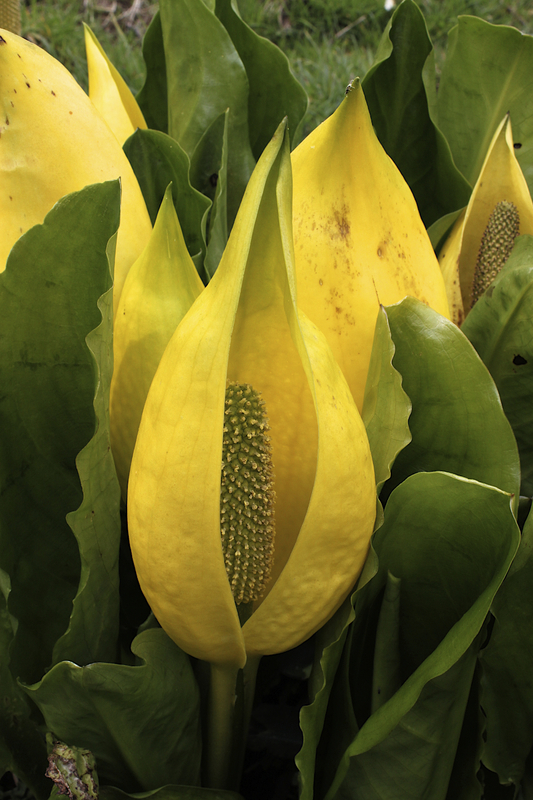 If the flowers and leaves are damaged (especially repeatedly, say by being stomped on by big dogs or picked by people who don’t know better) the rhizomes are unable to store enough nutrients to flower in following years. It seems there are not so many trillium this year as some. Too much rain? Too much picking? Who knows. Maybe it’s time for a sign to let people know what treasures the Port Orford Heads forest is sharing. And to leave them there for others to marvel at.